Here are some of my favorite Disney princess party games. Each game is themed after one of the Disney princess, I also added a few other princess game ideas because they were just too cute not too. 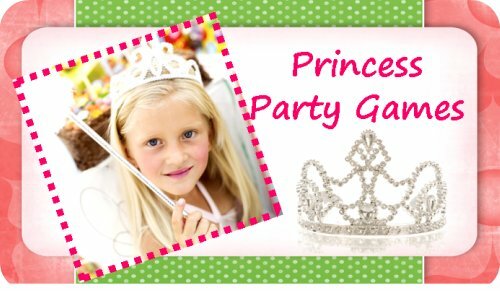 I hope you enjoy and find the perfect princess games for your party. In this princess game the guests must try and keep the red balloons in the air while the music is playing. Once she completes her challenge she can win a small prize or piece of candy. The music begins again and continues until all the girls win a prize. - twice as many red balloons as there are participants ( this ensures every guest has a balloon to grab when the music stops). Start with enough balloons for each guest. Add a new one after each round. - as many challenges as you have balloons. Simply write them on a piece of paper or print them out and put one in each balloon before blowing it up. - music to play. You can play kids songs, or even better for the theme are princess songs. This game turns the ol' musical chairs into a classic in princess party games hall of fame. Use poster boards and draw simple shapes with markers such as a diamond in a rectangle to give them more of a Arabian carpet look (you don’t have to go into much detail, keep it simple). You can cut slits across both ends to create fray for a bonus touch. Make enough carpets for guest minus one. Play this game just as you would musical chairs. Place the rugs in a circle and have the girls walk around them while the music is playing (again I suggest princess songs). When the music stops the guests rush to stand on a rug, one per princess. The one left without a rug can be in charge of the music for the next round. Take away a rug after each round, and play until there is only one carpet left. The winner is the last one on a rug. 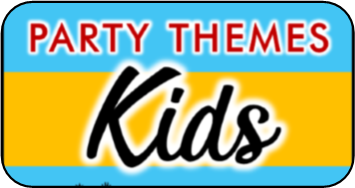 Non competitive party games are best for young children when winners and losers can leave a lot of hurt feelings. In this version, play with enough rugs for every guest. Make every rug a different color, or put a different color diamond on every rug. Play the music but this time when the music stops every child must find a rug to stand on. Call out a color and whichever child is standing on that color gets a small prize or candy. Start the music and continue playing until each child receives a prize. The trick is to keep track of which child has already received a treat already and call colors accordingly. Looking for under the sea party games? In this little mermaid relay race the princesses are divided into teams. The girls take turns using streamers to wrap around their team mates legs to form a “mermaid tail”. The princess must then hop over to the finish line and return to help the next princess on her team wrap her mermaid tail. The game continues until one team finishes the relay. This relay race involves each team getting two giant lily pads they must use to cross the finish line and return. The object is to never touch the floor. They hop on one lily pad and pull the other in front of them and hop forward onto that one. They repeat this until they circle the finish line and return to let the next princess hop. The first team that completes the relay wins. You can make the lily pads by cutting the shape out of two pieces of green poster board. Looking for a princess game for sleepovers? In this game Pillows (enough for each guest ) are spread across the play space with different objects under them. Only one of them has the pea (green golf ball) underneath. The princesses comes through and without peaking test out different cushions by sitting on them until they think they have found the one that has the pea underneath. Be careful many cushions are designed to trick you, and you never know what else might be found under the cushions ( get creative putting different household items under each) When all the princesses have found a seat then they take turns lifting them up to reveal who was really sitting on the pea. 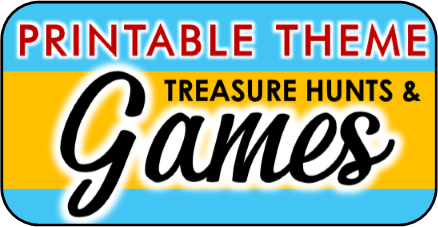 This printable treasure hunt is a Party Games Plus exclusive. It uses riddles based on the Disney princess movies for each of its clues. 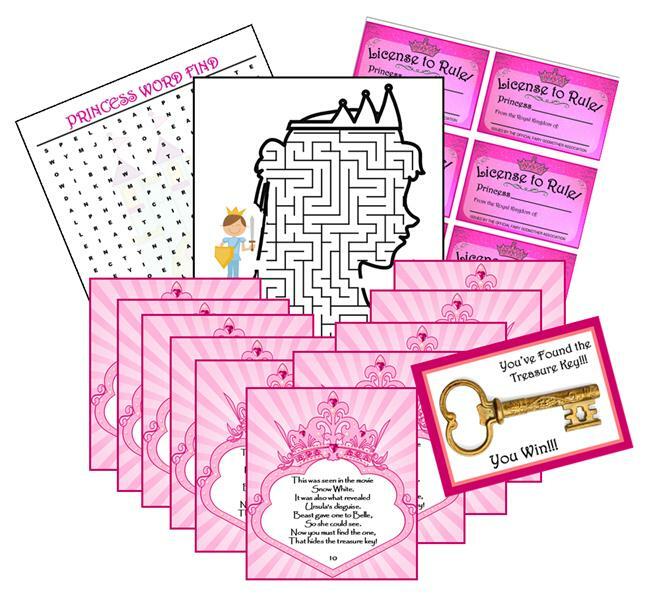 The answer to each riddle leads to the next clue.The treasure hunt come with 10 clues, a treasure key, instructions on how to play, 3 extra princess printables, and an optional personalized Disney princess invitation! . NO EXTRA PROPS NEEDED. This game is a fantastic twist on the old piñata and comes with a message for the girls: they can’t just sit around waiting for their knight in shining armor to come and save them; sometimes you gotta destroy the dragon yourself. This game best played outdoors or in a space large enough for running. The girls are each armed with a magic wand that they must use to catch the dragon. You can be the dragon or enlist the help of another adult with a fun spirit. You don’t have to dress up, but some chose to wear a simple mask or a full dragon costume. The little princesses must run and catch the dragon by touching him with the magic wand. When the dragon is caught the only way she/he can escape is to throw out some of her magic (candy) to distract the princess while she escapes. The game continues until all the magic is gone. Bag of candy. You can buy piñata candy at any grocery store or order it below. Enough magic wands for each girl. You can sometimes find them at the dollar store or you can purchase them below at $2.00 for a set of three. Optional: dragon mask or costume. If you’re feeling creative make your own. Dancing is a princess party must! All the girls attend the Royal Ball ready to dance the night away, but when they are touched by the magic wand they must freeze in place until they are touched with it again. If they move, laugh, or talk then they must sit out until the next song. If you would like to play princess music check out the one I mentioned in Poison apple Bop game above. It is full of princess favorites. Cut out the shape of a high heel shoes from a piece of white poster board. I would suggest 20 -30. Hide them all over the party area and have the guest search for them. You can offer to trade in value of a piece of candy for each. Print out a picture of a Frog prince and hang it on the wall. Now instead of playing pin the tail on the donkey play plant the kiss on the frog. Blindfold each little princess and apply lipstick on their lips. Spin them around three times and let them try and leave their kiss mark as close to the frog lips as they can. 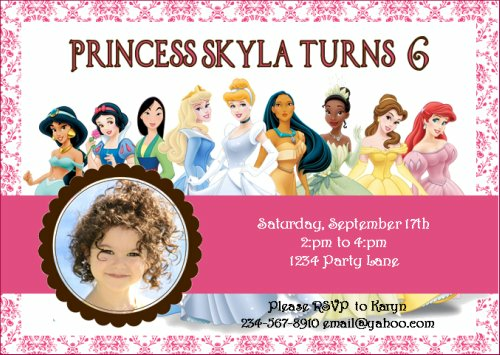 After each girl takes their turn write their names next to their print and let the birthday princess can keep poster as a keepsake. My list of royal princess birthday games wouldn't be complete without a princesses favorite accessory – Jewelry! The girls use jewel fishers (instructions below) to collect jewels and candy from the magic pond. The pond can be anything from a rug to a kiddie pool. To create the jewel fishers simply attach a small magnet ( you can find magnet stickers at Wal-Mart or the dollar store) to a string or ribbon about a foot long. Tie the other end of the string to a craft stick (again you can find these at Wal-Mart or Dollar store). Now all you have to do is buy some plastic necklaces and clip a paper clip to each one. Lay them in the “magic pond” and let the guest fish them out. You can play where each guest gets her own jewel fisher and they all fish at once, or you can make two jewel fishers and have the girls divide into teams and one person from each team goes at a time.